The Drumfire neck knife is a Pat and Wes Crawford design. It has a skeletonized handle and recurve tanto blade. Slim and lightweight, this neck knife stays with you and is ready in a pinch. 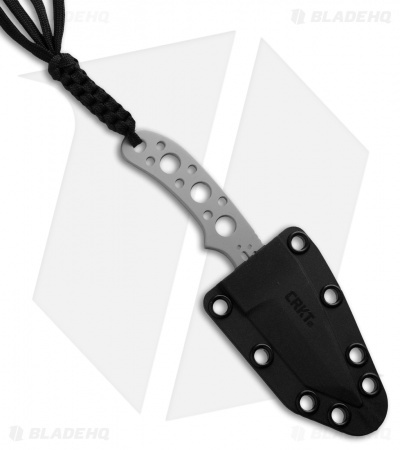 CRKT outfitted the Drumfire with a quick-release lanyard and a molded sheath with a J-hook clip. 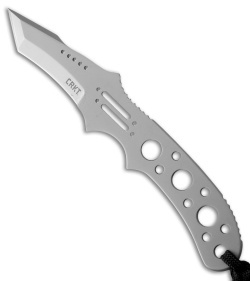 I bought this as a back up knife (around my neck) for when I'm out in the field hunting, kayaking, fishing, etc. One day I decided to take of the lanyard and throw it in my pocket for an every day carry -- it hasn't left my side since. It's super low profile. Easy to access from my coat or jeans. It's great for numerous every day tasks, and still great in the field. Love it. Love carrying it. Can't say enough good things about it. Give it a try, you may become a believer too. I decided to get my first fixed blade knife, but I also wanted something to be able to conceal, also I wanted a tanto (phone keeps correcting tanto to tattoo -_- ) style. It is really sharp, more sharper than my cheap $12 knife which is loosing some screws already holding it in place. Out of the box I practically almost sliced my finger taking it out of the sheath for the first time. So far I am happy with it since I can't even notice the knife on my belt. The only complaint I have about this knife is the j-hook that came with for the belt as I keep needing to tighten the screw; maybe it should came with a longer screw an extra washer and a nut so we can better tighten it. This knife is a great candidate for a custom paracord wrap. The sheath is great for a number of different carry options.